The assessment is a creative response in which students have the chance to develop their creative expression in response to the themes depicted within Shakespeare’s Macbeth. Students will be asked to write in the form of a play. This assessment will be targeted towards Year 10 English students. Purpose What is the purpose of this assessment? The purpose of this assessment is to encourage students to respond creatively to Shakespeare’s Macbeth, in order to foster a deeper understanding of the themes and/or characters presented within the text. Students have already studied and analysed the set text, in preparation for their creative responses. This will lead into the students’ final assessment task, which asks them to complete an analytical essay. Administer How will the assessment be administered? In order to effectively workshop and edit their work students, will be given a week to plan, draft, edit and finalise their creative response. Students will be provided with an assessment sheet which outlined 3 possible prompts relating to the themes of the text. In class, students will scaffolded through activities that encourage collaborative, peer-to-peer workshopping. They will also have the opportunity to work individually, in class and in their own time. Students will be guided to use 2 lessons to plan and begin writing, and 1 lesson to edit and submit. Record What records will be kept from assessment? The creative pieces will be marked by the allocated English teacher, and marks will contribute to the mid-Semester reports. If results are not perceived to be correspondent to the students’ expected mark, cross-marking measures may be implemented. Interpret How will the assessment evidence be interpreted for each student? Each creative piece will be annotated, and given feedback in relation to students’ achievements and future goals. 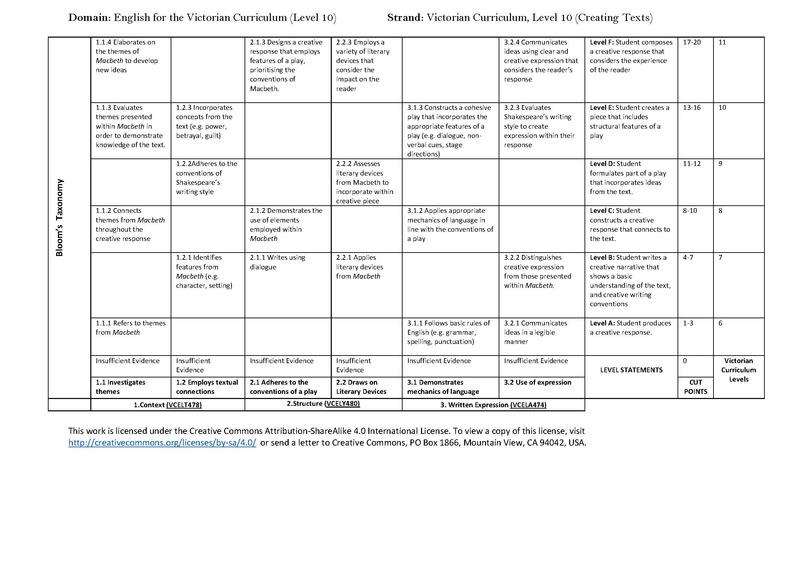 The assessment will be marked against the progression points within the Victorian Curriculum, listed within the rubric. The assessment outcome should reveal students’ analytical understanding of the characters and themes within Macbeth, and thus demonstrate the needs of future teaching practice. Use How will the assessment and its interpretation be used? The assessment and its interpretation will be used to inform future teaching practice, as it relates to upcoming assessments and models future VCE expectations. Students will also be given a chance to revise their creative responses, with the intention of further developing their writing skills. Outstanding Students create a piece that synthesises elements and/or themes of the text, and consolidates new ideas that considers the experience of the reader. High Students construct a sophisticated response to the prompt, by creating a narrative which considers the reader. This may include an evaluation of the themes from the text. Medium Students show a developed understanding of the text and the prompt through their response. Their writing begins to connect to the text through explicit references or implied links. Low Students demonstrate a capacity to write creatively in relation to a set prompt. Language indicative of this level is simplistic. Basic narrative conventions are demonstrated.